Okay I’m a little more ahead of the game than last week. Trivia done! This was a long one. Some of the writers like throwing in a lot deeper political/economic jokes which take way longer to look up. I’m not sure if it’s funnier, but it definitely takes more time;) Enjoy! 30 Rock S05E13: “¡Qué Sorpresa!” Done! I was going to say “just in the nick of time!” but this week’s episode has already aired. Okay so I’m behind! Anyway, I’m done! It’s finished! Trivia for all! This episode had some hilarious parts. I especially liked the look Liz gives when she refuses to stop for Carmen near the end. Anyway, new episode’s up. Enjoy! 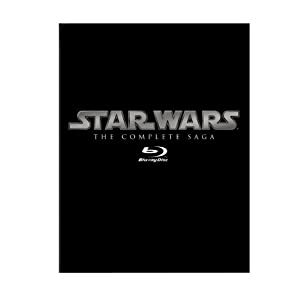 Okay, in stark contrast to my last post… Star Wars on Blu-ray is out! Okay not really related to 30 Rock. Well, they do like to make Star Wars references now and then. Anyway, help support my blog. Use the above link to buy from Amazon and I get a buck or two. Enjoy!! Is that a new episode?! Nope. It’s a topic close to my heart. Scientists are (far too slowly) closing in on a cure for death. If you haven’t heard about this before, you should learn more. Check out the Methuselah Foundation for info. Yes, I’m using my 30 Rock Trivia site as a soap box to try to gain support for the defeat of death itself — the irony isn’t lost on me. A thousand questions spring to mind, but there are answers for them all. Overpopulation wouldn’t be a problem due to already-declining birth rates, you wouldn’t be 400 years old and decrepit because if they can cure death they cure most death-related diseases as well, and there is no moral imperative to die, no matter what anyone tells you. I just visited a fantastic website chronicling The Fable of the Dragon-Tyrant. I think you should read it. 30 Rock S05E10 “Christmas Attack Zone” Triviaed! Okay Triviaed isn’t a word. But it’s done! And it looks like it’s just in the nick of time, but there’s no 30 Rock episode this Thursday, so I actually made it in plenty of time. When’s the next 30 Rock episode airing? I have no idea. I can’t find out anywhere. If anyone knows, tell me! On an unrelated note, I made bread this weekend. Very proud. Like a peaCORK, baby! Easy and delicious! Update: Looks like epguides.com wins! They’re super fast with finding out when new episodes air. Next 30 Rock episode IS…. January 20. Enjoy your Druidic Festival of Lights Eve, everyone! 30 Rock S05E09 “Chain Reaction of Mental Anguish” Trivia Done! Well, I certainly didn’t get around to any of the fancy site upgrades I wanted to last week. Oh well, there’s always next year! Today’s my birthday. Rah me! This week’s episode was pretty damn funny. Light on the trivia though. “Really, Cam?” you ask, “Is that why you got the episode out so soon after it aired, and not just before the new episode came out?” That’s right, loyal readers. On the nosey. No episode last night, which is bittersweet for me. Obviously I love me some 30 Rock. But I also love having a week where I can work on other stuff! The site needs some sprucing up. I mean, look at that right-hand column. The list of episode. LOOK AT IT! What is it just going to do? Just grow forever? One massive list of episodes on the right-hand side? Gross! I need me some drop-down menus, latest episode highlighted, and whatnot! WHATNOT! Feel free to browse through the older episode trivia. Enjoy a glass of wine while you do it. May I suggest a nice red Wirra Wirra Scrubby Rise? Delicious! 30 Rock S05E08 “College” Trivia Done! Hello my loyal followers! Trivia’s done for 30 Rock S05E08 “College”. Fewer references than normal, but still hilarious! Enjoy!